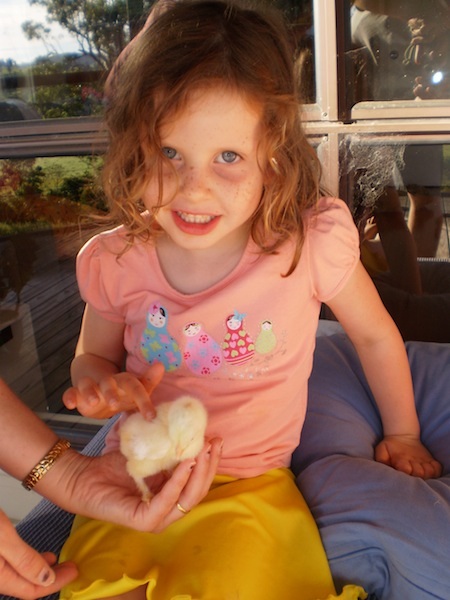 I was telling some friends at work about our new chicks, and when I mentioned that we were growing them out for meat they asked if our girls – aged 4, 6 and 8 – knew. To be honest, we’ve been upfront with them since before the chicks hatched. We’ve been clear all along that these chickens are for eating, and they don’t have a problem with that. They know that they’re being well looked after, and they’re not living in the cramped conditions that most commercial meat chickens endure. The cows in the neighbour’s paddock next door are beef cows, and the girls also know where they’re going to end up. Like all kids, they ask questions (like “how do they turn them into meat?”), which we do our best to answer in ways they can understand. If you’re going to eat meat, I think it’s best to understand fully where it comes from. Once you do, and you still choose to eat meat, then raising your own meat animals is very appealing from both a food quality and animal welfare standpoint. That said, the kids aren’t going to be helping with (or even seeing) the actual killing and processing until they’re much older! They do help in the kitchen with cooking the prepared meat, though. These chicks are crossbred, so they don’t have any value in keeping for breeding. Since their mothers are hybrids (ISA Browns), which won’t breed true to type anyway, they wouldn’t be great egg-layers either. The father is a Brahma, which will mean they’ll have a bit more meat on them than the normally-lean ISA Brown. There are better crosses for meat birds, but they’ll still taste good. So why did we breed them, then? We wanted to test out the incubator and get experience with raising chicks, growing them out in the pastured-poultry style, and killing and dressing them. Rather than starting with expensive fertilised purebred heritage eggs (which can run $30 or more per dozen! ), we figured it was much better to start with what we already had available for free. Our Brahamas will be coming into lay soon, and when they do we’ll be ready to breed purebreds from them. We also have a spare rooster at the moment, rescued from a friend’s parents’ flock. He was getting too aggressive with their new pullets and killed one, so they had to get rid of him. I’m not 100% sure yet, but I suspect we’ll be eating him too. Our youngest daughter has named him Apricot (as in apricot chicken!). When the time comes, I’ll do an article about processing the chickens. It’s actually not very hard, and well worth doing if you’re a meat-eater with any interest at all in where your food comes from. When I was a kid, my parents decided to raise beef calves one year. They made the mistake of letting each of us kids name one, so it was quite a shock when the calves went off to the slaughterhouse. For years after that, I was the next thing to a vegetarian — I ate a little meat when politeness demanded it, but that’s all. I wonder whether I wouldn’t have had a very different relationship with meat if they hadn’t let us name the cows, and if we’d been involved in the slaughtering. 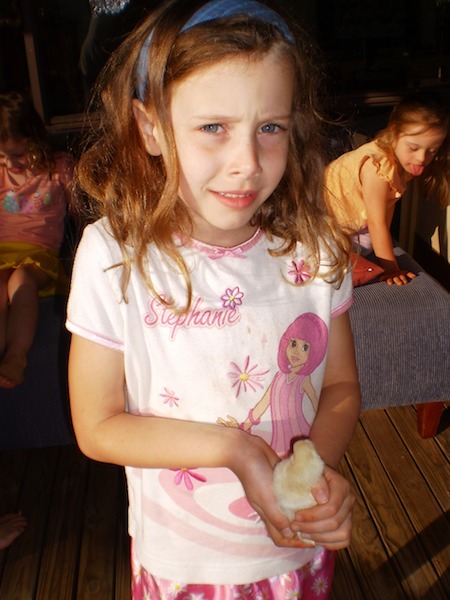 When Mark and I killed our first chickens, it was a very powerful experience, and I’ve read about people who let kids as young as yours be involved with good results. @Avian Aqua Miser: Yes, they say you should never name animals that you’re going to eat! We get around this by giving them food-related names. We had a rooster named Stew (who actually ended up roasted). The kids didn’t miss him when he went, since it was clear from his name what he was going to be for. These chicks are named Roast, Burrito, Casserole and Cacciatore. Of course we can’t yet tell them apart, so the names are just placeholders at this stage. 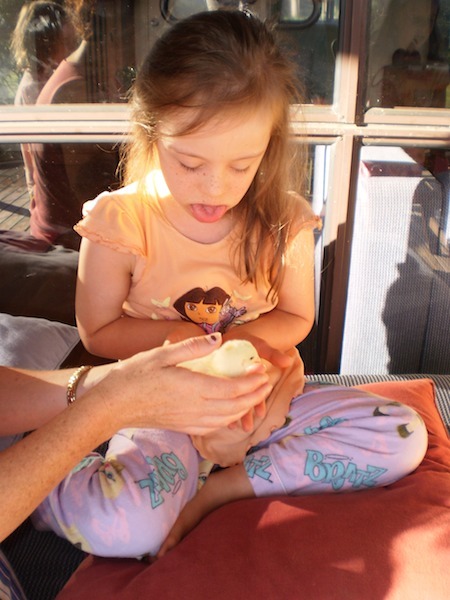 It’s good involving the kids in the naming of the chickens, as it gets them thinking about all the different ways you can use chicken and exploring the world of food more. Another tactic that works well with kids is to start a new clutch of chicks three weeks before you plan to slaughter the current batch. Then the cute new chicks just hatching out will distract them from the loss of the previous batch, who, let’s face it, aren’t so cute anymore. It’s also good to start with animals like chickens or rabbits, that breed rapidly in large numbers and are slaughtered after only a few months. Starting with something like a calf would mean that you’ve got that one animal for quite a long time, meaning the kids will have bonded a lot more closely with it before it reaches slaughter age. That’d be more traumatic, especially if they haven’t gone through the animal-into-meat process before. It’s always good to be honest with kids, and that applies to everything really not just food. I so wish I had the nerve to eat my own chickens, I have very stern talks with myself about it but just can’t get to grips with the idea. I never eat meat by choice anyway, only because the family expects it. @Greenfumb: I agree about the honesty thing with kids. They’ll catch you out every time if you’re not straight up with them! Killing and processing chickens seems like a really big deal until the first time you get the opportunity to be involved, and from then on it’s not that hard. It’s just getting over that first hurdle that’s difficult.